On stand-by waiting for a suitable gap in the weather we eventually made the call and flew in "ZS-BLUe Skies", the PAC 750 XL (one of the best skydiving aircraft around), first to Lanseria, then to Sikhuphe International Airport. 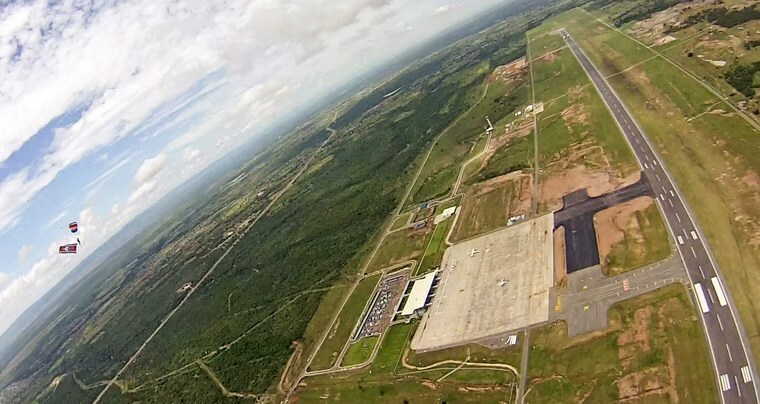 At Sikhupe airport we were met by humid air and dramatic skies, completed formalities, and checked out our landing area for the next days displays. On the brand new apron we rigged up flags and coloured smoke canisters, and prepared for our displays. 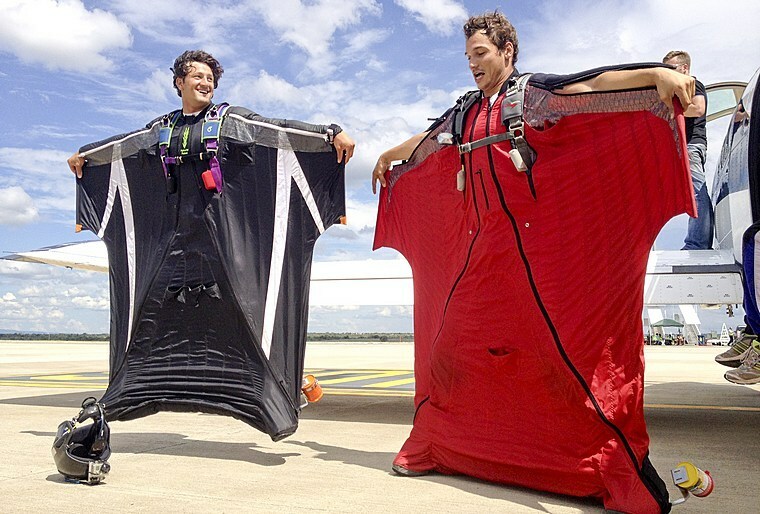 Fred and Waldo rigged up their wing suits. As people started to arrive for the days event we took off for our first display of the day. Graham with the Swazi flag coloured smoke canisters attached to his leg. 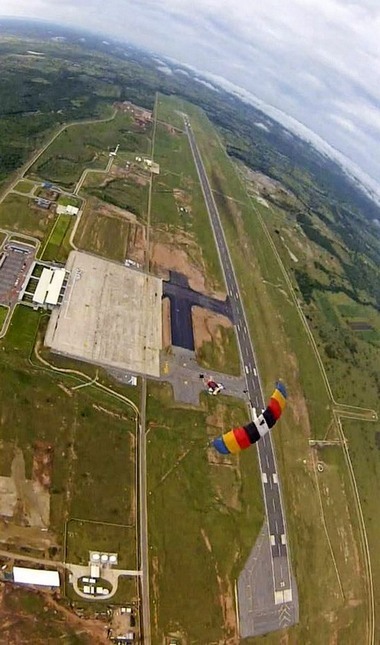 On jump run at 11 000 ft AGL, spotting for the drop. 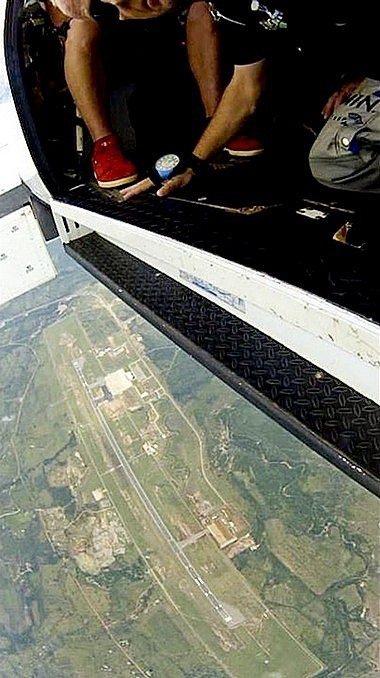 Time for a little play in free fall. 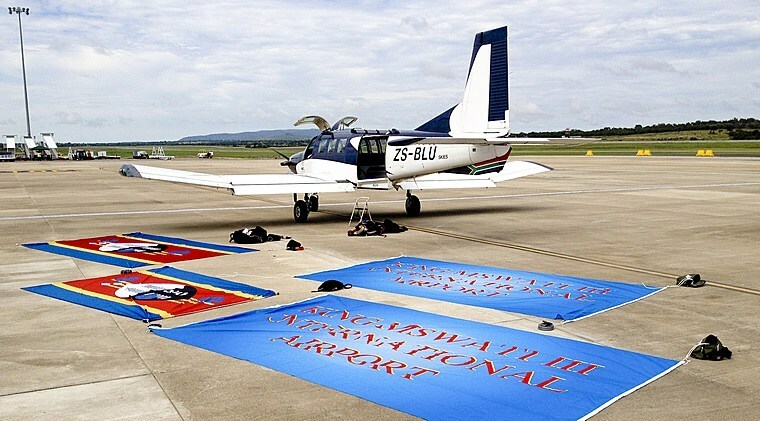 The Swaziland flag parachutes and national flags flying overhead King Mswati III International Airport. Unfortunately, as the program for the day ran on, the weather started to close in. The flight home provided some dramatic skies and an opportunity for everyone to have a rest after a busy day. The Jumpers - Graham Field, Mike Rumble, Frederik Potgieter, Waldo Prinsloo, Chris Moller, Bailey Edmunds Jnr, Josie Coetzee.